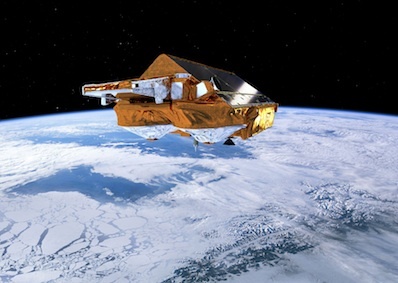 Europe's CryoSat 2 satellite sailed through a performance review last week, confirming it is ready to map Earth's eroding polar ice caps for the next three years. The Oct. 22 review of CryoSat 2's commissioning phase verified the $194 million mission is operating well. The spacecraft and science payload are functioning as expected and already returning useful data. "Commissioning has been a very busy period that has thrown up a number of minor problems in both the space and ground segments," said Robert Cullen, the European Space Agency's CryoSat 2 commissioning manager. "However, thanks to a brilliant team we have handled each of these in turn and now have a very stable system. As a result, we have been able to make some key improvements to the science processors that will soon be ready for operations." CryoSat 2 blasted off April 8 from Kazakhstan on a Dnepr rocket, a Soviet-era ballistic missile modified to haul satellites into orbit. The rocket delivered CryoSat 2 into an accurate orbit nearly 450 miles above Earth, setting the stage for six months of testing and data verification before normal science work begins. The craft's twin SIRAL radar altimeters were activated days after launch. Scientists last week said the mission's primary payload was stable and collecting data within specifications. Built by Thales Alenia Space, the dual radars are designed to gather information day and night and through all weather conditions. Officials say the SIRAL system can map ice elevation to a precision of about one centimeter, or a half-inch. "Considering this is a low-cost mission, CryoSat arguably carries the finest satellite radar ever flown and has the most effective ground segment I've ever seen," said Duncan Wingham, the mission's chief scientist from University College London. CryoSat 2's French orbit determination system, named DORIS, is also providing very accurate positioning data, according to Cullen. ESA developed CryoSat 2 to replace a spacecraft lost in 2005 during a launch mishap. The spacecraft was built by EADS Astrium. The satellite will be the first to measure the thickness and mass of both land and sea ice near the Earth's poles. Approximately 20 percent of the planet's surface is covered by polar ice, and about 80 percent of Earth's freshwater is kept inside continental snow, ice and permafrost. Polar ice reflects sunlight, insulates oceans from polar climates, regulates ocean circulation, and has far-reaching implications for sea levels and global climate.